I apologize for the sad picture of these goodies. Our two oldest kids were practically out the door when they announced that they needed something to bring to the Young Adults Bible Study Group get together. 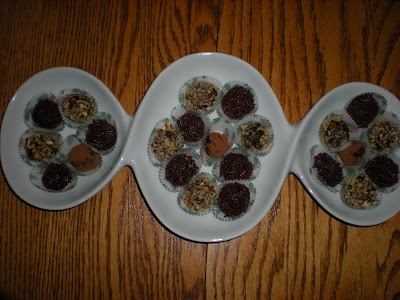 These truffles turned out lop-sided and in a variety of sizes ... but they tasted delicious and so I thought that I might share the recipe. I found this recipe in the Company's Coming Millennium Edition cookbook, but I have tweaked it a bit to suit my pantry and taste buds. Combine first 4 ingredients in medium heavy saucepan. Heat and stir over low until chocolate is melted and mixture is smooth. Cool in refrigerator until almost hard. With buttered fingers, shape into 1 inch balls. Roll each ball into one of the 'extras' listed. It looks best if an assortment of extras are used rather than just one. Pop each truffle into tiny muffin liners for an eye popping presentation. NOTE: For 14 oz can of sweetened condensed milk, use 12 X 1 oz chocolate baking squares. These are elegant to serve at any gathering or lovely to give as a gift.